Home / Articles / Are You Going to Heaven? What if you died tonight? Are you absolutely confident where you will dwell in eternity? And most people believe that they are going to Heaven. However, Jesus taught that Heaven is not an automatic destination. Jesus said: “Enter through the narrow gate. For wide is the gate and broad is the road that leads to destruction, and many enter through it. But small is the gate and narrow the road that leads to life, and only a few find it.” (Matthew 7:13, 14, NIV). Jesus asked this profound question: “What good is it for a man to gain the whole world, yet forfeit his soul? Or what can a man give in exchange for his soul?” (Mark 8:36, 37, NIV). Is anything more important than knowing where you will spend eternity? The Bible teaches there are only two destinations where people spend eternity. One is in Heaven, with God’s presence forever and the other is in Hell, separated from God’s presence forever. This separation place, that was created by God, was designed for the devil and his angels. Jesus spoke of this place when He said, “Depart from Me, you cursed, into the everlasting fire prepared for the devil and his angels…” (Matthew 25:41, NKJV). It is not God’s desire for man to dwell there (1 Timothy 2:3-4; 2 Peter 3:9). The Lord says, “I have no pleasure in the death of the wicked,.. Turn, turn from your evil ways!” (Ezekiel 33:11, NKJV). But we have the power to send ourselves there through unbelief or ignorance. We decide where we will spend eternity. God is very interested in the choice you will make that will decide your eternal destination. The apostle John said, “I write these things to you who believe in the name of the Son of God so that you may know that you have eternal life.” (1 John 5:13, NIV). Believe it or not, God wants you to know that you can spend eternity with him. Do you want to know more about this guarantee? Other religions offer no guarantees that you will go to Heaven. Islam teaches that one must do good deeds and that salvation can only be attained through Allah being pleased with you. In Hinduism, the law of Karma says you reap what you sow but you never know your form of rebirth until after you die. In Buddhism, rules are added, seemingly, without end. These religions are based upon the word “do”. Do this or do that and maybe you will get to Heaven. None provide the assurance that you can reach Heaven or nirvana. Only in Christ, or Christianity, can you be sure if you are going to Heaven. So how does the Bible answer this question about how you can be sure you where you will eternity? Our sin separates us from God. Romans 6:23 explains, “For the wages of sin is death, but the gift of God is eternal life in Christ Jesus our Lord.”(NIV). But God has provided a remedy for this separation caused by the effects of sin. “God made Christ, who never sinned, to be the offering for our sin, so that we could be made right with God through Christ.” (2 Corinthians 5:21, NLT). Because of his great love for us, Jesus took the punishment we fully deserve by voluntarily dying on a cross for us. God the Father poured out his wrath toward sin on God the Son. Jesus became the perfect sacrifice for our sins. He became our substitute. When Jesus was on the cross, he said, “It is finished”(John 19:30). The Greek word translated “it is finished” was normally written across certificates of debt when they were canceled. It meant “paid in full”. 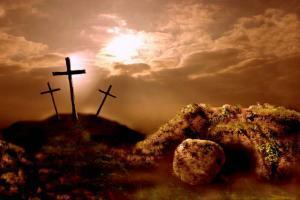 Three days after his death, Jesus Christ arose from the grave, just like he said he would do. He then blazed a new path to Heaven, opening the way for all of those who would trust in him, to follow. Jesus Christ paid in full our debt of sin and now God does not have to judge us as our sin deserves. As believers in Christ we are welcomed into God’s home, Heaven. So what must we do to go to Heaven? According to the Bible, there is only one way to Heaven. Jesus declared, “I am the way, the truth, and the life. No one can come to the Father except through me.” (John 14:6, NLT). “…if you confess with your mouth, ‘Jesus is Lord,’ and believe in your heart that God raised him from the dead, you will be saved.” (Romans 10:9-10, NIV). You are saved from the direction sin was taking you, away from God to Hell — to the new direction caused by faith in Christ’s work, to be with God in Heaven. Believing in Christ means that you put your total and complete trust in him for your salvation. But you need to choose to receive Christ and follow him. A criminal can be offered a pardon by the governor, but if it is rejected, that pardon has no effect. In the same way, Jesus offers us a complete pardon for all of our sins and the free gift of eternal life, but it is not put into effect unless it is accepted. Are you ready to receive this free gift now? Whoever believes in the Son of God accepts this testimony … God has given us eternal life, and this life is in his Son. Whoever has the Son has life; whoever does not have the Son of God does not have life. (1 John 5:10-12, NIV). God has given every person the freedom to choose their own destiny. He didn’t have to do that. He could have created us to be robotic people programmed to love and obey him. But then our compulsory love would be meaningless. God wanted us to love him freely. In real relationships, we want someone to love us for who we are, not out of compulsion. But to make freely exchanged love possible, God created human beings with a unique capacity: free will. How will you choose? Will you choose to accept God’s amazing offer of forgiveness and eternal life? Or, will you decide to reject it or even ignore it? The choice is yours. But choose wisely because you are determining your eternal future. Becoming a Christian not only involves your intellect and your emotions, it also involves your will. You must be willing to receive Christ by faith into your life. Next Has Science Discovered God?